Click for more animal news items. British animal charity the RSPCA has urged UK Members of Parliament (MPs) to vote to save 100,000 British badgers when a debate takes place in the parliament at Westminster, London, on 13 March 2014. Even though badgers and the setts (burrows) they live in are legally protected under the "Protection of Badgers Act 1992" applicable in most of the UK but the law is different in Scotland, more than 1,800 badgers have been slaughtered between August 2013 and March 2014 as part of the Government's badger culling policy. On its website today, the RSCPA - which calmly refers to the cull as 'misguided', urged MPs to vote against going ahead with rolling out the cull which would threaten as many as 100,000 further badgers.
" The scientific credibility of the Government is at risk and will be undermined unless they to move away from this discredited policy. We urge MPs to recognise that and vote to stop any further roll out of the cull. _ The RSPCA has long campaigned against plans for a widespread badger cull for both scientific and welfare reasons and the failure of the pilot culls simply reinforces our view. The badger cull is not the answer to the problems of bovine TB in cattle. _ Evidence suggests that Wales saw a 24% drop in new bovine TB cases last year and that was due to vaccination programs and effective biosecurity." He is not alone. 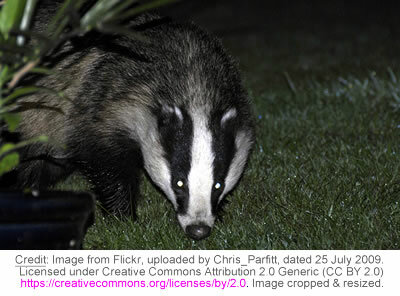 Many animal welfare groups, members of the public and celebrities such as Brian May of the Rock Band "Queen" have expressed concern for the welfare of British wildlife, including badgers, together with strong objection to the recent badger cull. The pilot badger culls in Somerset and Gloucester failed to meet the 70% 'targets' set by the government and deemed to be necessary in order for the cull to have any chance of reducing bovine TB in cattle. That is yet another respect in which the policy has already proved to be an embarrassing catalogue of errors, misjudgement, mismanagement and failure. In just the last two weeks, it was reported that the Independent Expert Panel (IEP) tasked by the government with evaluating the culling also found the pilots were not just ineffective but inhumane too - with more than 5% of culled badgers taking longer than five minutes to die. The UK Royal Society for the Prevention of Cruelty to Animals, which is generally known as the RSPCA, has been working to prevent cruelty, promote kindness to and alleviate suffering of all animals since 1824. For further information see www.rspca.org.uk. News is included on the IvyRose website to inform visitors about current health, humanitarian and animal-related subjects, but not to endorse any particular view or activity. Any views expressed in the article above are not necessarily those of IvyRose Ltd.. At least some of the material in this news item was released by the the RSPCA on 11 March 2014 and may have been edited (e.g. in style, length, and/or for ease of understanding by our international readers) for inclusion here..